After the UK Nationals a month ago Dylan and I sat down and had a chat about what we needed to do to really move the Rocket SSD (Solid State Deck) on. There were some prototypery related build issues with Rocket Raccoon and his boat was still a bare shell in build, so we had the opportunity to change a few things. While the boat was obviously fast with the higher wings and smoother shapes, there was definitely room for improvement. The forward mast position was causing some problems lowriding in a chop, especially with the extra heft that the Raccoon was carrying, so we’ve moved the mast/deck/daggerboard aft a bit to improve the seaworthy-ness. While for ages we had the benefit of bigger wand/foil spacing with a small sprit, the Exocet adding a full length bowsprit had made a noticeable catch-up so that was an easy add-on. Then there was the diet. When you start with something so out of the field it’s really hard to know how to pitch things with material. Raccoon really was solid – actually the best place to start as we wouldn’t have learned anything if it had folded up on the first sail! Then it was just a question of looking at everything and seeing where little losses could be made. Thinner foam here and there, going a bit lighter on the skins, a bit less uni in the ‘I’ beams across the cockpit. It’s all added up nicely and ‘Stingray’, as she is now known, is much closer to the ballpark weight-wise. It’s been a wild few months, as always a bit too hectic for me and my sailing has suffered – but coming out the other side we’ve come up with something that looks totally badass and is certainly the nicest Moth I’ve ever sailed. Hopefully Dylan can overcome the little tune-up time I’ve left him with and put in a good showing at the Europeans. The SSD Rocket will see production for anyone that wants one, while the high wings, revised geometry and long sprit will all transfer across to the version 3 Rocket for all new boats. Would love to be out there watching and cheering on, but I’ve got a bit too happy with the grinder while fixing/dismantling Rocket Raccoon and have a long list of rebuild to crack on with. Better make the most – will be sailing again by Paignton GP! So Emma just reminded me that I do have a website and it looks like I fell off a cliff years ago. I’m just putting the final bits of paint and hardware on, before handing the Raccoon over to Dylan for a few months for testing while I build the second one which will be his actual boat. Hopefully with a bit of time on the water we can put a half decent showing at the Euro’s and see what this badboy is capable of. We’ve launched a brand new International Moth, which we believe will be even faster than the very successful Ninja design. The first boat will be turning heads at the RYA Dinghy Show this weekend, showing off the latest in Moth design and technology. The Rocket, which is being built here at Aardvark HQ, is an innovative new design that will stand out from the rest. Its distinctive bow-sprit wand and flashy paint job will be sure to catch the eyes of visitors to the International Moth stand (Stand C34). The bow-sprit wand, teamed with a mast and centre foil position that is much further forward than other designs, will improve the boat’s longitudinal stability. This should improve control and reduce drag, making the boat easier to handle around the course. “The launch of the Rocket is really exciting for Aardvark Technologies. We’ve been working on the design and thinking about improvements to the build process for a while now, and its brilliant to see the new boat on the water. The Rocket has a great race pedigree, with its predecessor, the Ninja, winning the UK National Championships twice, as well as the Europeans in 2011. And with top 49er sailor Dylan Fletcher having already placed his order, it seems certain that the Rocket will build on that success. Mike will be on hand both days of the Dinghy Show to answer any questions and talk boats. The new Rocket Moth design has taken to the water, with a tune up sail at Queen Mary against the Ninja death squad followed by the Tiger Pursuit last Sunday. Early impressions are great and it’ll be good to start getting some air miles in. Order book is fast filling up and it’s looking like a busy season! After several good years with the Ninja design it’s time to move things on at Aardvark HQ. We’ve had some ideas as to where we’d like to take the Moth to move it forward and after some successful experiments this season we are launching a new design over the winter. The Rocket will be an evolved version of the long-footprint Ninja that Giovanni Galeotti has been trialling over this season with a new hull shape and improvements all round with the aim of improving reliability and repeatability of setups. The hull plug is being machined in the next couple of weeks along with some new prototype foils and the Rocket will take to the skies in the Autumn…. This year the UK International Moth Class Association stand at the RYA Dinghy show looks set to be as busy as ever with an exciting 2012 racing season fast approaching. As usual there will be an enthusiastic group of ‘mothies’ manning the stand ready to answer any questions you might have about the boat. These could range from questions about getting started in the class to more technical questions on setup, technique & construction – there will be a cross section of sailors more than happy to help. 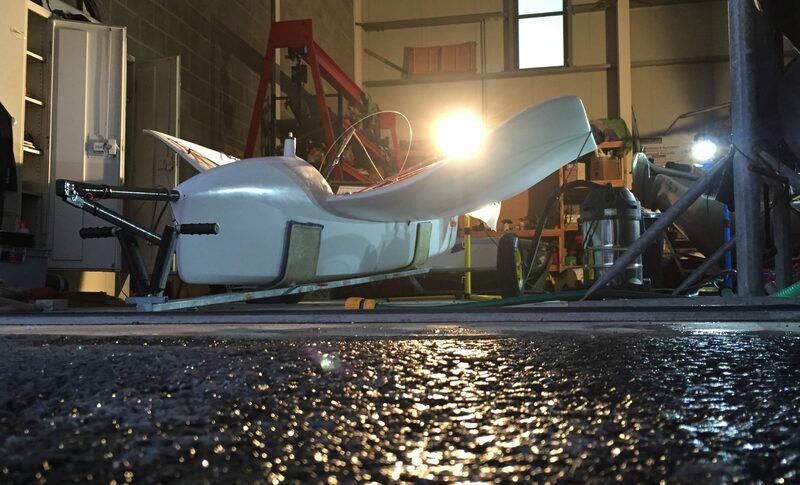 This year there will be two leading designs on display in the form of the National & European Championship winning Ninja by Aardvark Technologies in Bristol and the World Championship winning Mach 2 design from Australia. As ever throughout the winter innovation has continued and some of the latest enhancements such as the latest iteration KA & fibrepath Hyde Sails will also be on display. Mike will be at the show both Days to answer questions about the Ninja – you’ll probably find him on the Moth or Cherub stand or looking for good tea… Bring cake! Congratulations to Ninja sailor Chris Rashley who fought a tight battle with Simon Payne down at Paignton over the weekend to secure the open and the Grand Prix series for 2011. This tops off a fantastic first year for Chris and we’re looking forward to seeing what he can do in 2012!